Today in the Wall street Journal,there was a story about another app. Camera Awesome is SmugMug’s new iPhone app. What a name, right? Who doesn’t want something named Awesome. I am no photographer but pretend like I am, so if there is an app that helps me in any way, I get it. This one is pretty fun and makes it easy to post pictures to many of the social network platforms. Pictures can also be stored on Smugrug as high res images. Smugrug is a photo storing site with unlimited storage for a monthly fee. i played with this pic so much I couldn’t tell you what all i did to it. Before you even take a picture the Awesomness begins. There is a timer that lets you take pictures at intervals. It even has image stabilization for those shaking hands taking pics with your iphone. 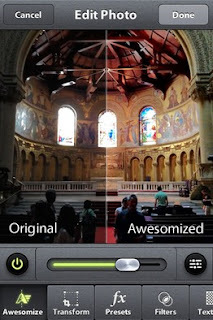 Awesomize- adjust the sharpness, temperature,vibrancy and contrast by moving each slider up or down. Transform- easy to choose sizing settings including cropping the picture to an 8″ x 10″ or rotating it 90 degrees. 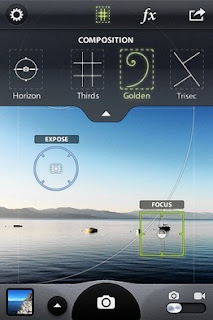 Presets- (filters) has all kinds of filters for your pictures. If you like Instagram, you will love these options like Roman Holiday, Lone Star,Road Trip, More Cowbell, More Wang and more. There are portrait presets, including B&W presets. 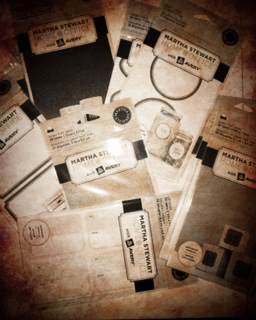 Filters- If the preset filters are not enough… continue adjusting your picture with over 20 more choices. The app has 297 presets, filters, textures and frames. This app is free with 36 of the effects, but as you start playing with the features there is a cost for the additional features. This one looks like something that will be well worth the .99. No more poor quality shots taken from a smartphone. The app also has a video recording feature. The app is designed to take pictures as quick as possible so your phone will not freeze up. When you have effects you like, the process can be applied to multiple pics. Gotta go, play with some pictures and add more cowbell. They are working on an Android version of this app. Have a good weekend. Awesomeized? I like that word. Carrie needs an Awesomized Schnibble. So glad I have an iPhone. Thanks!